Flood Resiliency - Fitzgerald Environmental Associates LLC. Fitzgerald Environmental Associates (FEA) was a principal team member with consulting firm ESPC working under contract to the Town of Keene to develop a stream channel restoration design for a segment of Gulf Brook that flows through the Village of Keene. The Gulf Brook overflowed its banks during Tropical Storm Irene causing extensive damage in the Village (photo credit: M. & R. Giampaolo). During flood recovery the channel was dredged and hard armored on one bank; in-stream habitat was severely degraded by the effects of the flood and the recovery work. The flood recovery work left this segment of the brook more vulnerable to flooding than it was prior to Irene. Our Project Team was tasked with developing a solution to improve the channel to increase flood resiliency, control sediment transport, and provide aquatic and riparian habitat within the project area. FEA completed a comprehensive assessment of existing river conditions including fluvial geomorphic assessments, aquatic habitat assessments, hydrologic and hydraulic modeling (HEC-RAS), and an assessment of environmental resources. Through simulations of flow and sediment deposition in the channel, FEA determined that the discharge during Irene was likely double the previously-estimated 100-year flood. FEA and ESPC designed five (5) boulder cross vanes, flood benches, and vegetated armor slopes to increase flood resiliency and improve aquatic habitat. The project was constructed in November, 2014. FEA and ESPC provided full-time construction oversight services. 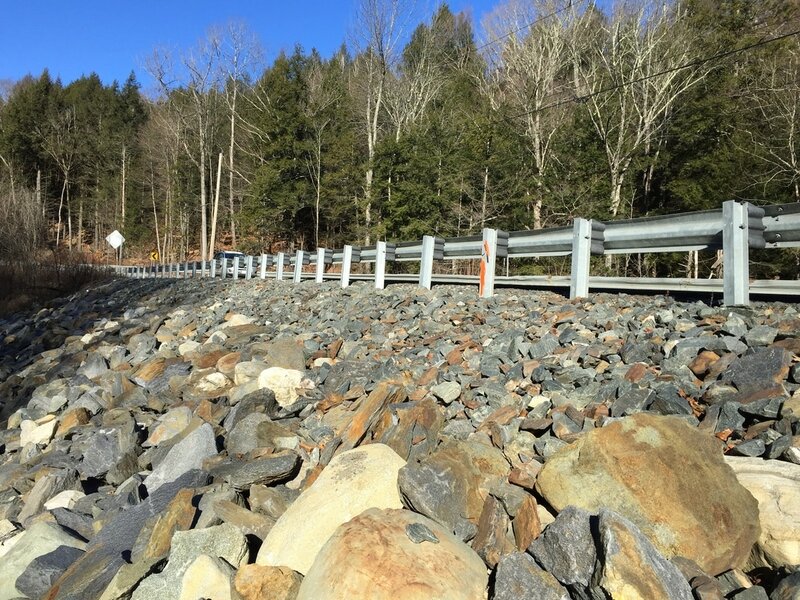 Fitzgerald Environmental Associates (FEA) is working with VTrans, VTDEC, and USACE to incorporate geomorphology guidance into permanent structural repairs along road and river corridors throughout Vermont following severe flood damage incurred during Tropical Storm Irene in 2011. Evan Fitzgerald was selected by VTrans to be the lead coordinator of a team of five consulting river scientists and engineers from various firms to address over 150 unstable roadway areas throughout Vermont. FEA has provided technical design guidance including hydrologic-hydraulic modeling (HEC-RAS; see plot right) and mapping of erosion hazards, coordinated statewide permitting efforts, and overseen construction on over 40 sites in Vermont since 2012. FEA is also carrying out river-road corridor vulnerability assessments in various hard hit areas using LiDAR data to develop hydraulic models and slope instability predictions. Fitzgerald Environmental Associates (FEA) is working with a team of consulting firms and VTRANS to develop a methodology for assessing the flood vulnerability of roads and structures during large storm events. FEA has compiled and analyzed data on streams, roadways and flood damages incurred during Tropical Storm Irene in 2011. These analyses of vulnerability to inundation, undercutting or washout from fluvial erosion, and deposition during flood events are coupled with the criticality of the roadway for an overall assessment of failure risk along the transportation system to be used for site prioritization. Field verification of scores to refine methodology was conducted in 2017. Road risk is assessed as a function of criticality and vulnerability to inundation, erosion, and deposition.